Adele Emily Sandé, MBE (/ˈsændeɪ/ SAN-day; born 10 March 1987), known professionally as Emeli Sandé, is a British singer and songwriter. Born in Sunderland, Tyne and Wear and raised in Alford, Aberdeenshire by an English mother and Zambian father, Sande rose to prominence after being a featured artist on the 2009 Chipmunk track "Diamond Rings". It was their first top 10 single on the UK Singles Chart. In 2010, she was featured on "Never Be Your Woman" by the rapper Wiley, which was another top ten hit. In 2012, she received the Brit Awards' Critics' Choice Award. Sandé released her first solo single "Heaven" in August 2011. She has two number-one singles across the UK and Ireland with "Read All About It" with Professor Green and "Beneath Your Beautiful", a collaboration with Labrinth. Her album Our Version of Events spent ten non-consecutive weeks at number one and became the best-selling album of 2012 in the UK, with over 1 million sales. In 2012, she performed in both the Opening and Closing ceremonies of the London Olympics. She won two Brit Awards at the 2013 ceremony: Best British Female Solo Artist, and British Album of the Year. In 2016, she released her second studio album Long Live the Angels, which debuted at number 2 on the UK album chart. In 2017, she won the Brit Award for Best British Female Solo Artist, becoming her fourth win in total. Sandé was also appointed Member of the Order of the British Empire (MBE) in the 2017 Birthday Honours for her services to music. Adele Emily Sandé was born in Sunderland, to a Zambian father, Joel Sandé, and an English mother, Diane Sandé-Wood, on 10 March 1987. Her father, having moved from Zambia, met her mother while they were both at the polytechnic in Sunderland. The family moved to Alford, Aberdeenshire, Scotland, when she was four. Sandé wrote her first song at the age of 11, for her primary-school talent show. She remembers. "That was the first time I thought I might be a songwriter. I always knew I wanted to be a musician and I knew I wanted to write because the people I was listening to all wrote. I never thought it was an option to sing anyone else's songs. The first song she wrote was called "Tomorrow Starts Again" – the song had proper structure and even a middle eight. Sandé attended school at Alford Academy, where her father was a teacher. She said, "I hated to be ill and to miss a day because I was so hungry to learn. I was very shy, nerdy and extremely well-behaved. Inevitably, throughout secondary school, it was part and parcel of my identity that I was Mr. Sandé's daughter. No way could I muck about or get into trouble, because it would've got back to him within minutes. And Dad was strict, let me tell you." Choice FM invited the 15-year-old Sandé to London to take part in their "Rapology" competition. Richard Blackwood also had her down to MTV's Camden studios to sing gospel. It was the first London appearance of her career. By the time she reached the age of 16, she had a record deal with Telstar within reach. However, understanding the opportunity that university could also offer her, she turned down the deal. She studied medicine, in the five-year MBChB course at the University of Glasgow, but left after obtaining a degree in neuroscience. She has stated that education was important to her, because, if her music career failed, she would have something to fall back on. Her manager Adrian Sykes, she said, had waited patiently from when she was 16: "Adrian really respects that I want to get an education behind me. He also knows my parents are keen that I finish university". There have been many who have inspired Sandé throughout her life. One important influence was Frida Kahlo, so important that she has a tattoo of the artist's portrait on her forearm. Just after leaving medical school, she made the decision to get the tattoo, which, for her, represented strength and bravery. Kahlo was inspirational for Sandé due to the unique story of her battle with polio at a very young age that went on to inspire her artwork. She knew that her decision to pursue music and quit school would require a sense of fearlessness that she gained through Kahlo's expression of art. Sandé's sister made a video of her playing the piano and singing to one of her favourite songs, "Nasty Little Lady". They sent the clip to Trevor Nelson's BBC Urban music competition. Sandé won the show and was offered a record deal, but the management that she met via the competition decided against the deal. Emeli had become involved in the Urban Scot collective who helped and encouraged her career by promoting her in Scotland, and – according to Emeli Sandé: The Biography by David Nolan (2013) – also released an album of songs called Have You Heard? on Glasgow's Souljawn Records, which was sold at gigs. Several tracks were also made available to download. Her parents also sent BBC Radio 1Xtra a CD of her songs. Ras Kwame played her on his "Homegrown Sessions", and four artists that year were asked to do a show in Soho. She met with Watford-born music producer/writer Shahid Khan aka Naughty Boy, who had previously worked with Ms Dynamite and Bashy, and they began writing tracks for artists such as Alesha Dixon, Chipmunk, Professor Green, Devlin, Preeya Kalidas, Cheryl Cole, and Tinie Tempah. Sandé soon signed a record deal with Virgin Records and EMI Records. In an interview, she said "I was doing a show in London for 1Xtra and I met this guy called Naughty Boy. We got in the studio and we clicked work wise. We just started writing, not necessarily for me, we just thought 'let's write a pop tune' and experiment. And we wrote the Chipmunk track and I thought nothing of it. Naughty Boy sent it off to Chipmunk who really liked it and wrote his stuff around it." She signed a record deal with Virgin Records in 2010. She later signed another deal with EMI Records in early 2011. Sandé made her singing career debut in 2009 after appearing on the track she wrote for Chipmunk's first debut single, "Diamond Rings". The single charted at No. 6 on the UK Singles Charts, making it Chipmunk and Sandé's first ever Top 10 Hit. She later appeared on another single singing guest vocals, after collaborating with Wiley on his comeback single "Never Be Your Woman", the single charted at number-eight on the UK Singles Charts becoming Sandé's second consecutive Top 10 Single. Sandé decided against using the name Adele Sandé, due to Adele's growing success, so used her middle name instead. She revealed: "I changed it as soon as Adele came out. I just thought, 'You've kind of taken the [name] now', so I went with my middle name. She was just getting bigger and bigger, so I thought I just really need it. Sandé revealed her first solo single would be released in early 2011. There was some speculation surrounding which track she would release, after many newspapers stated that it would be "Daddy". The first official single from her upcoming debut album was "Heaven", released on 14 August 2011. The song received positive reviews from blogs such as This Must Be Pop and Robot Pigeon. She confirmed that "Daddy" would be the second official single released from Our Version of Events. Sandé achieved her first number-one single on the UK Singles Chart after "Read All About It" entered at number-one. On 26 November, Sandé performed at the LG ARENA in Birmingham for BRMB 2011. On 15 December 2011, she was named as the Brit Awards Critics' Choice for 2012. Her album Our Version of Events reached number one in the UK after its release in February 2012. Sandé's debut album includes songs written by her and has been reviewed as having "richly melodic, classically powerful, retro-futurist soul-pop songs". It was announced that she was up for another BRIT Award in 2012, for British Breakthrough Act. Sandé went on to write material for the original line-up of Sugababes. On 24 January 2012, Sandé performed a one-off gig for Q Magazine at XOYO, London. She was supported by British soul singer Michael Kiwanuka. She recorded a version of David Guetta's "Titanium" and the pair performed the song at NRJ Music Awards in France. Sandé has penned a track for Naughty Boy's upcoming LP entitled "Hollywood" which features soul singer Gabrielle. It is about fame coming and going and will be released in November. On 27 July 2012, Sandé sang "Abide with Me" at the opening ceremony of the 2012 Summer Olympics, and her song "Heaven" was used to accompany the section with Sir Tim Berners-Lee. Both appear on the Isles of Wonder CD of the opening ceremony's music. NBC also used her song "Wonder" during the credits roll at the end of the tape-delayed ceremony broadcast in the United States. On 12 August 2012, Sandé sang "Read All About It (Part III)" at the closing ceremony, while a video montage of emotional scenes from the games was shown. She also covered a version of John Lennon's "Imagine" exclusively for the BBC, who used it for their end credits montage at the conclusion of their Olympics coverage. Sandé is a winner of the 2013 European Border Breakers Awards. The European Border Breakers Awards honour the best new music acts in Europe. The award ceremony takes place at the Eurosonic Noorderslag music festival in Groningen (NL). She won two BRIT 2013 awards for Best British female and Best British Album. In January 2013 it was revealed that Ella Henderson has anticipated work with Sandé on her debut album. The song "Next to Me" won two Ivor Novello Awards for "Best Song Musically and Lyrically" and "PRS for Music Most Performed Work" in 2013. In May 2013, she performed at the White House in Washington, D.C., as one of the featured artists at the award ceremony when President Obama presented Carole King with the Library of Congress Gershwin Medal. In June 2013, Sandé started writing her second upcoming studio album, which was released in 2016. She had already written several songs, including "Pluto" with Naughty Boy, "Enough", "Call Me What You Like", "You and Me" and "This Much Is True", which was written for her former husband, Adam. During U.S. Summer Tour in July 2013, Sandé performed "Free" from Rudimental's album Home, "Lifted" from Naughty Boy's album Hotel Cabana. With her speedy success worldwide and especially between the UK and the US, Sandé has been a presence in many important campaigns, aside from her powerful stance on social justice through her songwriting. Whether through performances at fundraising concerts or campaigns of her own, she backs up her lyrics of social change and equality with action. With the honour of performing at Elton John's AIDS Foundation Event in 2013, she has shown her support in raising money and awareness for the HIV/AIDS problem in the world. More specifically, she understands the seriousness of HIV/AIDS in her father's home origin of Zambia which provides a deeper passion to support the cause. She is also one face of Fashion Targets Breast Cancer in the effort to also create awareness and funding for the fight against breast cancer. More recently, Sandé has helped launch a programme of her own called "Community Clavinova", a nationwide opportunity for organizations of many kinds to receive free Clavinovas through the partnership of Sandé and Yamaha UK. As a passionate musician, she understands the importance of having resources and is excited to help provide groups with the opportunity to receive such a great contribution their organizations. In 2013, Sandé revealed that she has been working on her second studio album, slated to be released in 2016. On 15 November 2014, Sandé joined the charity group Band Aid 30 along with other British and Irish pop acts, recording the latest version of the track "Do They Know It's Christmas?" at Sarm West Studios in Notting Hill, London, to raise money for the 2014 Ebola crisis in Western Africa. On 25 August 2016, Sandé shared a preview of a song from her upcoming album entitled 'Intermission' on her social media accounts, with the caption "Inhale, exhale, release and let yourself receive forgiveness." Following a number of teasers, it was announced that "Hurts" would be released on 16 September as the lead single. Describing the song, she said: "I wanted to release 'Hurts' first because it felt like everything I've avoided saying for so long. It's a real explosion. It's everything I wish I'd said years and years ago. I didn't want to hold anything back anymore." On 15 September, Sandé announced on her social media accounts that her new album would be called 'Long Live The Angels' and that it would be released on 11 November 2016. Her song Hurts from the album Long Live the Angels was published on 5 October. The album was released on the proposed date. The album debuted at number 2 on the UK album chart. The following year, Sandé gave her Long Live the Angels Tour, which is her first to include Arena dates. In 2017, she received the Brit Awards' Best British Female Solo Artist award, becoming her fourth win in total. On 2 October 2017, Sandé was also awarded with a BASCA Gold Badge award in recognition of her unique contribution to music. On 12 April 2019 Emeli Sandé announces her much anticipated third album, Real Life, out June 7 on Virgin/EMI/Universal Music. Recorded following an intense personal journey of self-doubt and self-discovery, Real Life marks a brand-new chapter and with it a bold, confident and fearless new sound. It's an extraordinary album and emblematic of an artist emerging defiant and powerful. Sandé possesses a soprano vocal range. Sandé has said she wants her music to be remembered like that of Nina Simone, one of her favourite artists. Sandé was first exposed to Simone at the age of eight, hearing her perform the song "Why?" after the assassination of Martin Luther King Jr. After hearing such sorrow yet uplifting lyrics and expression through Simone's performance, Sandé was inspired to have a similar future with her music career. She also said: "These days nothing lasts, music is like fast food, you're in then you're out. She said, as much as she would like, she would never play the piano as well as Simone, but she would give it her best shot. She loves the songs Simone produced, including "I Wish I Knew How It Would Feel to Be Free" and Simone's version of "I Think It's Going to Rain Today". She said that Simone's original songs are very poetic: "So when I listen to commercial stuff at the moment, I’m just thinking ‘haven’t you heard Nina Simone, haven’t you heard how a song should be written?" She went on to say "We choose and consume, feast and forget, then rush on to the next hot thing. There's no point chasing that kind of success because it's so transient. Far better to follow (our) own paths and be true to (ourselves)." Sandé began working in the studio with Naughty Boy in 2009, where the pair first worked together on Chipmunk's debut album, I Am Chipmunk. When Sandé was 16 years of age, her parents took her to Alicia Keys Songs in A Minor Tour and she said she always wanted Keys to hear her music. She spoke on why she likes Keys so much: "I’d read about her background and identified with her on so many levels. She was mixed race like me, a great student who'd been top of her class, who played piano and loved Nina Simone. And there she was in the pop charts, yet with songs that had a message. I saw 16,000 people hanging on her every word and thought, "I want this kind of attention. I want Alicia to know my music." The pair met when Sandé had just came back from New York and just began a second songwriting stint, but this time involved with Keys. The pair sat at a piano and played for hours trying to come up with a good track. She said that she wanted the songs on her debut album to be fresh and she wanted to try and take it back how she wrote songs at the beginning of her career. Sandé had classical music training as a songwriter in her teens and learnt to play the piano at an early age, and getting across that she played, made and wrote her own music was very important to her. She said on the album, she wanted people to see every side of her as an artist, so it was important to have songs there where there could be a real connection with the lyric, rather than there just be throwaway pop music. Joni Mitchell and Lauryn Hill were also major influences for the album. "I have just finished a song with Cher Lloyd, called Lifetime, for her new album. I have another on Leona Lewis's next album and one that has been recorded by Susan Boyle. That's probably my proudest moment. Susan recorded my song, called This Will Be The Year, last week, for her next album. There is another called River, which I am hoping she's going to record. While making her debut album, Sandé began to work with Tinie Tempah. She co-wrote "Let Go", on which she provided guest vocals. She also started working with Devlin after recording a song titled "Dreamer". Sandé later revealed she would be working on Alesha Dixon's upcoming album, The Entertainer. She co-wrote the hit single "Radio" along with Shahid Khan. and co-wrote tracks on Cheryl Cole's albums as well as Professor Green's album, which Sandé gave guest vocals on. She said that she is Simon Cowell's favourite songwriter at the moment[when? ]; due to her writing songs for Leona Lewis and Susan Boyle. Sandé stated in an interview; she said that she would love to meet Boyle after writing songs for her saying, "I haven't met her yet. I just sent her the song. I'd love to meet her because I think she is a bit of a rock star." Sandé cowrote "This Will Be The Year" for Boyle and songs for Leona called "Trouble" and "Mountains". It was revealed after Professor Green announced his album tracking list for his album, At Your Inconvenience, that Sandé would feature on the first single from the album, "Read All About It". The single was released in October 2011 before the album was released. The pair also performed the song live on The X Factor results show. She draws on influences for her music from Nina Simone, Joni Mitchell, Lauryn Hill and Amy Winehouse. Sandé said that all her songs were about World peace and political issues. Sandé said that the key to a good song when songwriting is using "honesty" and "raw emotion" as the best way to write. She said that if she attempts to write something which is "too smart", the creative process will not work for her. "Kill the Boy" was one of the first ideas that came to Sandé's head. She said if she has to work on a song longer than a day, she will not go back to it, as she said it won't work. She went on to say if it was to work, that the idea for the song would be almost instant. In January 2012, Sandé confirmed that she was engaged to her then unidentified, long-term boyfriend of seven years. Her boyfriend had requested not to be identified and Sandé said that he is not in the music industry but is a scientist. Sandé's fiancé was revealed as marine biologist Adam Gouraguine when the pair married in his home nation of Montenegro on 15 September 2012. Sandé said she would legally take his name, but would still be known professionally as Emeli Sandé. In November 2014, Sandé revealed that the couple had divorced after a year of marriage. Sandé was appointed Member of the Order of the British Empire (MBE) in the 2017 Birthday Honours for services to music. ^ Emeli Sandé (2012). Singer-songwriter Emeli Sandé Interview (YouTube). Theoutnet. Event occurs at 0:05. Retrieved 1 February 2012. 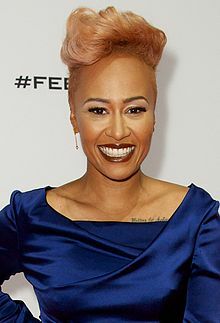 Hi, I'm Emeli Sandé. ^ a b "Emeli Sande wins Brits Critics Choice award". BBC News. 15 December 2011. Retrieved 1 January 2012. ^ "Scots singer Emeli Sande wins critics' choice". BBC News. Retrieved 28 September 2014. ^ "Olympic torch: Highland relay clashes with major events". BBC News. Retrieved 28 September 2014. ^ "Sandé claims biggest selling UK album of 2012 so far". Digital Spy. 29 November 2012. ^ a b "Our Version of Events Emeli Sandé | Format: Audio CD". Amazon.com. Retrieved 17 February 2012. ^ Ian Garland (28 July 2012). "Emeli Sande Wows At London 2012 Olympics Opening Ceremony". CapitalFM. Retrieved 12 January 2019. ^ "Olympics Closing Ceremony: Emeli Sande And Madness Lead London 2012 Conclusion". CapitalFM. 12 August 2012. Retrieved 12 January 2019. ^ "Brit Awards: Sande wins two awards". BBC News. 20 February 2013. Retrieved 11 March 2015. ^ Martin, Gavin (10 February 2012). "Rising star Emeli Sandé on her debut album". Mirror. Retrieved 28 April 2013. He's from Zambia and he and mum got together in the 80s in Sunderland where I was born. ^ "Sande: 'I felt like an alien in Scotland'". Herald Scotland. Retrieved 28 September 2014. ^ a b c d e f g h i j k l m "Emeli Sande information, BRIT Awards 2012". Brits.co.uk. Archived from the original on 20 October 2014. Retrieved 28 September 2014. ^ Dingwall, John (2014). Emeli Sande Read All About It. Omnibus Press. p. 23. ISBN 978-1-78305-357-5. ^ Gannon, Louise (20 April 2013). "'I guess I never believed it could really happen to me': Why Emeli Sandé finally ditched her medical studies to become a pop star". Daily Mail. ^ "Scottish singing sensation Emeli Sandé in Studio Q". YouTube. Retrieved 28 September 2014. ^ "Deadline News talks about Sandé's time at University". Deadlinenews.co.uk. 28 August 2009. Retrieved 28 September 2014. ^ "Frida's art on my sleeve; For a new series of ITV's Perspectives, pop star Emeli Sande reveals how the celebrated Mexican artist Frida Kahlo has inspired her throughout her life". 11 May 2014. Retrieved 15 October 2014. ^ David Nolan, "Emeli Sande – The Biography" at Amazon. ^ a b Mulderrig, Amie (9 March 2010). "Watford music producer Shahid Khan has notched up another chart hit". The Watford Observer. Retrieved 24 April 2012. ^ a b "R&B singer Emeli Sande signs new publishing deal". Deadlinenews.co.uk. Retrieved 28 September 2014. ^ "Chipmunk – Diamond Rings ft Emeli Sande". Chartstats.com. Retrieved 28 September 2014. ^ "Emeli reveals why she changes name". Digital Spy. 19 August 2011. Retrieved 19 August 2011. ^ "Emeli Sandé – Heaven". YouTube. 9 June 2011. Retrieved 28 September 2014. ^ Kate Goodacre (15 December 2011). "Emeli Sandé named Brit Awards Critics' Choice for 2012 – Music News". Digital Spy. Retrieved 1 January 2012. ^ "Emeli Sande Wins The Brits Critics Choice Award". MTV. 15 December 2011. Retrieved 1 January 2012. ^ "Musicfootnotes". Musicfootnotes. Retrieved 17 February 2012. ^ "Ed Sheeran leads Brit Award nominations". RTÉ News. 12 January 2012. Retrieved 12 January 2012. ^ "Gabrielle to feature on Naughty Boy song "Hollywood"". Gabrielle. Retrieved 28 September 2014. ^ "Ella Henderson writing with Adele songwriter for debut album". Digital Spy. 22 January 2013. Retrieved 2 February 2013. ^ "The Ivor Novello Awards 2013: Winners in full". Digital Spy. Retrieved 16 May 2013. ^ "Obama Honors Carole King with Gershwin Prize". ^ "Breakthrough Breast Cancer". Retrieved 15 October 2014. ^ "Music News". Retrieved 15 October 2014. ^ "Band Aid 30: One Direction among celebrity line-up". Telegraph. 11 November 2014. Retrieved 11 March 2015. ^ "Emeli Sande announces comeback single: "It's a real explosion"". ^ "Emeli Sande To Release Stunning New Album "Real Life," On 7 June 2019". Top40-Charts.com. Retrieved 12 April 2019. ^ Mumbi Moody, Neseka (4 June 2012). "Review: Emeli Sande stuns with her debut". Yahoo AP. Retrieved 1 April 2013. ^ McCormick, Neil (10 November 2016). "Emeli Sandé finds heartbreak on a higher plane – review". The Telegraph. Retrieved 6 November 2017. ^ McNulty, Bernadette (13 November 2016). "Emeli Sandé: Long Live the Angels review – politely lovelorn". The Guardian. Retrieved 6 November 2017. ^ a b c d e f "Emeli Sandé: Meet music's new darling, who is living her 'dream come true'". Daily Mail. 3 February 2012. Retrieved 3 March 2012. ^ "Emeli reveals why she changes name". Daily Record. 6 January 2011. Retrieved 6 January 2012. ^ "Talks about what she wanted to achieve with Our Version of Events". Norwich Evening News. 3 April 2012. Archived from the original on 23 April 2012. Retrieved 3 April 2012. ^ a b c "Emeli talks about working with Boyle, Lewis and Lloyd". Daily Record. 2 August 2011. Archived from the original on 25 October 2011. Retrieved 2 August 2011. ^ "Emeli features on Professor Green's upcoming single". The Music Fix. 3 August 2011. Retrieved 4 August 2011. ^ "Emeli and Professor Green perform on The X Factor". SoulCounter. 24 October 2011. Retrieved 24 October 2011. ^ "Interview: Emeli Sande — The UK phenomenon taking the R&B world by storm." TheNext2Shine.com. Archived from the original on 29 March 2013. Retrieved 10 August 2012. ^ Alison Rennie (12 January 2012). "Emeli Sande reveals she's engaged". Evening Express (Scotland). Archived from the original on 29 July 2012. ^ "Emeli Sande Confirms Engagement!". punchbowlblog.com. 12 January 2012. ^ Amelia Butterly (17 September 2012). "Emeli Sandé marries long term partner Adam Gouraguine". BBC Newsbeat. ^ Craig McLean, "Emeli Sandé: ‘We were mates, but maybe we shouldn’t have been married’", The Times, 10 November 2014. ^ Jessica Earnshaw, "Emeli Sande shock divorce: A look back at long romance but brief marriage to Adam Gouraguine", Mirror, 10 November 2014. ^ "No. 61962". The London Gazette (Supplement). 17 June 2017. p. B22. 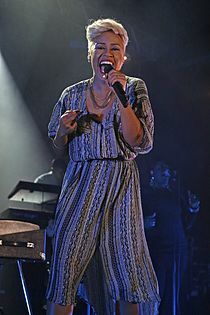 Wikimedia Commons has media related to Emeli Sandé.